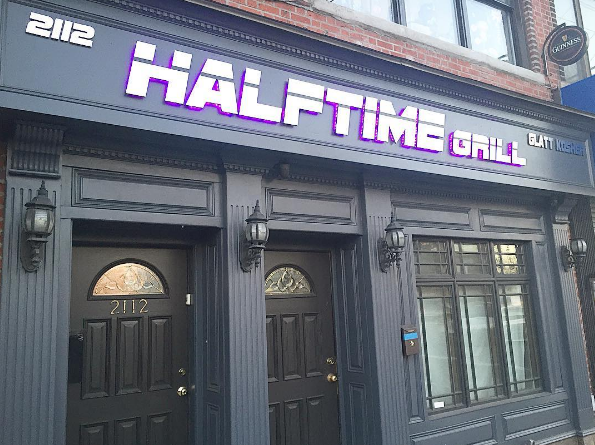 Before it opened the week before Pesach, I was able to get a sneak peek before Halftime Grill‘s grand opening. My first impressions were: cozy, intimate, well designed, and perfect place to catch the game with (or without) your friends. Because of its small size, I recommend making reservations for nights with big games on, but on most other nights I don’t believe reservations will be required. The restaurant is also in process of renovating the area behind the restaurant which will also be outfitted with TVs and will more than double the seating capacity at Halftime during the warmer months. Be sure to catch the NBA playoffs & finals, NHL playoffs & finals, the Olympics, MLB games, and eventually NFL games at Halftime Grill accompanied by a fully kosher menu. When driving down Flatbush Ave. I actually missed it. It’s directly across the street from where Ave. N bisects Flatbush Ave. and physically between Quentin Rd. & Ave. P.
The bar is beautiful. It just makes you want to pull up a seat and never leave (assuming there’s a good game on behind it). Loving the big screens with the Yankees on!